Olive Ayhens is a painter who is influenced by her surrounding environments both spiritual and physical. Her paintings often blur the boundaries between the interior and exterior combining both to create surreal and political environments. Ayhens received both her B.F.A and M.F.A from San Francisco Art Institute. 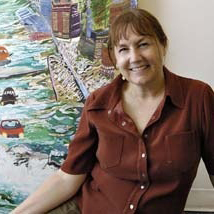 Her work has been exhibited throughout the US including: Roswell Museum and Art Center, New York State Museum, D.C. Moore Gallery, San Francisco Museum of Modern Artist Gallery, Berkeley Art Center, Lenore Gray Gallery, and many more. Her and her work have also been reviewed in Art New, Hyperallergic, New York Magazine, Art in America, The New York Times, and San Francisco Chronicle to just name a few. She currently lives and works in New York, NY.